I'm a bit late posting this, but on Wednesday evening I ran down to the front and back. The Forerunner ran out of juice (must charge it for Saturday) but it was about 4.5 miles. A run to Firle Beacon and back. Sunny on the way out, cloudy on the return route. 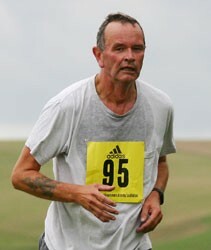 And six days to go till the Beachy Head Marathon. Today I ran for the first time since the Jog Shop Jog: it was hard, but not too hard and my knee held up, though my ankles suffered a little). I chose a short trip round Stanmer park and it was a beautiful autumn day. I have decided to do the Beachy Head marathon, come what may. If my knee gives me trouble, it can be no worse than last year, when I still finished, albeit slowly. And if I'm careful, I may get round faster, my target being under five hours. It was glorious weather for the Jog Shop Jog today; but I am ashamed to say my own performance was less than glorious and I was pulled up, as we say in horse-racing circles, just a little over half way through. The ankle, which I had been worried about, held up well. But my knee, which had given me trouble on this run in 2004, became worse and worse. I am extremely grateful to some spectators who kindly gave me a lift back to the Marina. Tomorrow I am going to consult a physiotherapist, if I can find one, to see whether Beachy Head might be possible or not. Some last hills before the Jog Shop Jog. 1 mile warm up and cool down, six quarter mile ascents and jogs back down. A wet run over the downs and as far as part of the feared Big W that I shall be running on Sunday. The ankle was a little tender still, as I contrived to twist it again this morning.